As part of Yahoo! Singapore's coverage of the 2011 General Elections, we speak to new faces to look out for in the coming weeks. In the first of a four-part series, ALICIA WONG speaks to DR VINCENT WIJEYSINGHA of the Singapore DEMOCRATIC PARTY. As a social worker, Dr Vincent Wijeysingha would assess and propose solutions to problems facing a person or family. However, over the course of his analysis, he felt that the root of these problems stemmed from the current systems in place. That left him with two choices: Continue in social work and support the ruling political party, or join politics to change the system. 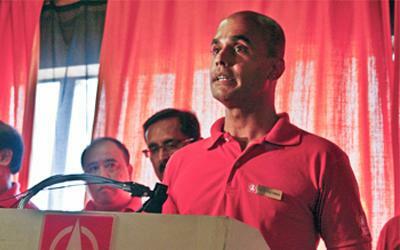 The new face at the Singapore Democratic Party (SDP) chose the latter. "Politics and social work stem from the same value base; that human beings are important and (have) the right to live a fulfilling and dignified life," stated the 40-year-old social policy doctorate holder. Dr Wijeysingha, who is also the executive director of civil society group Transient Workers Count Too, returned to Singapore last July and joined the SDP. Speaking to Yahoo! Singapore in a 45-minute interview, he explained that he was attracted to the party's commitment to people, families and the community. "It is a coherent party, constructive about programmes and compassionate to the less fortunate," he said. The changes he and the SDP will champion for include abolishing Goods and Service Tax for basic goods and removing the profit motive for public services such as housing, education and healthcare. The party released its 10-point SDP Promise to voters on Saturday, setting out what a SDP MP would seek to achieve if elected into Parliament. While the ruling People's Action Party frequently argues that the needy in Singapore are well taken care of, Dr Wijeysingha terms this a "false argument". He cites bureaucracy being one of the difficulties that lower-income families face in accessing funds. He also dealt at length on the cost of living difficulties the middle-income and high-income group face, for instance, when an elderly falls sick and needs long-term care. Dr Wijeysingha is expected to contest in Holland-Bukit Timah group representation constituency, a place which he has close ties to. He recounted spending almost all his weekends in Serene Centre in 1987, as his then girlfriend lived in Sixth Avenue. He also served national service in Mowbray Camp at Ulu Pandan Road. More recently, he lived in a HDB flat at Holland Village for a few months when he returned to Singapore last July. 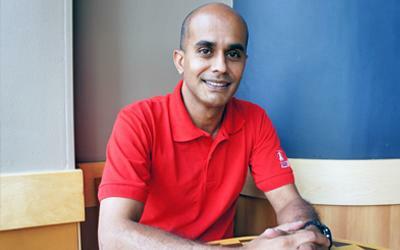 "I grew up in a similar socio-economic area, Seletar Hills," he shared. "So there's some sort of affinity with the needs of that community." Living in a HDB flat also gave him an understanding of residents' needs. "I'm not trying to pretend I'm a working class hero, I'm not. But you get to learn about the problems of living in a HDB flat." To those worried that his 16 years away from Singapore means he is out of touch with local concerns, Dr Wijeysingha joked about the benefits of belonging to a South Asian family. "There's always a wedding, a funeral or something. One year I came back four times, two weddings, two funerals. So you never lose touch of what's going on," he quipped. While in the UK, he worked in child protection and later started a social work consultancy. He would return to Singapore at least once a year and spent about a year here, in total, when he was conducting research for his PhD. "So I don't think I've ever emotionally or intellectually left the country," he said. When speaking to Dr Wijeysingha, it is hard to forget his father, Eugene Wijeysingha, is the well-liked former principal of Raffles Institution, and in Dr Wijeysingha's own words, an "Establishment man". So how did his family take the news that he would be joining opposition politics? "It's not surprising in my family that people do social work, teaching, but when I got involved in formal politics, they were apprehensive," he said. "When I told them it was SDP, even more apprehensive," he said, with a laugh. But after explaining his views and including them in party activities, they are "gradually coming around," he said. On a scale of one (least supportive) to 10 (most supportive), he believes they are now at a six. Recalling the most important advice he has received, told to him by a close friend, Dr Wijeysingha said, "Don't ever forget why you are doing what you are doing."